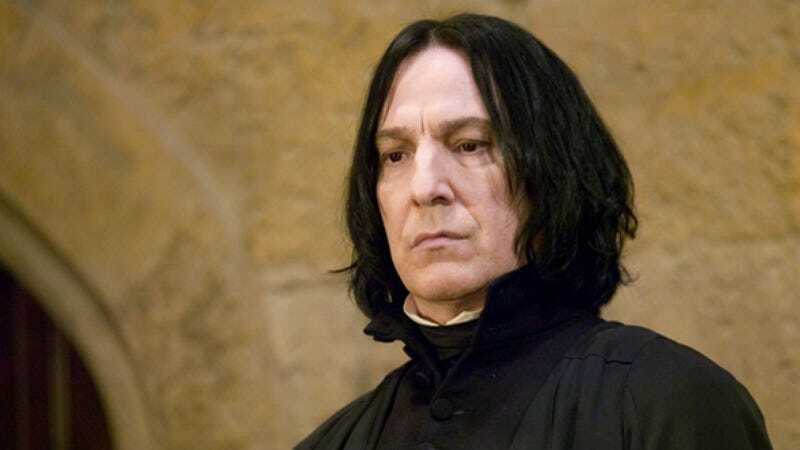 After 10 years in Harry Potter films facing all manner of fantastic beasts, Alan Rickman will once again deploy his signature brand of contempt on a magical creature. This one has it coming, though. According to Deadline, the actor has joined Olivia Cooke (Bates Motel) and Douglas Booth (Jupiter Ascending) in an adaptation of Peter Ackroyd’s best-selling novel Dan Leno And The Limehouse Golem. The film, which will be called The Limehouse Golem, is set in 1880s London, where a series of murders has shaken the community to the point where people believe the crimes are the work of a golem, a mystical creature from Jewish folklore that is created from inanimate matter, typically dust or mud. The film is described as being in the style of David Fincher’s Se7en and James Watkins’ The Woman In Black, so we hope the actors enjoy standing under rain towers all night. Number 9 Films’ Stephen Woolley, who will serve as one of the film’s producers, said, “It’s going to be the first time the world will see the amazing universe that Peter Ackroyd has created that has a more sensational twist than The Crying Game!” This suggests that either the golem is an elaborate hoax perpetrated by one of the human characters, or that this film will feature the world’s first transgender golem. Either way, Rickman’s expression will be priceless.